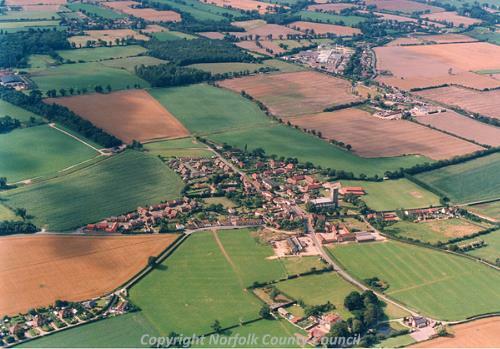 Worstead is a large parish situated in the North Norfolk Local Government District, with an area of some 1060 hectares. 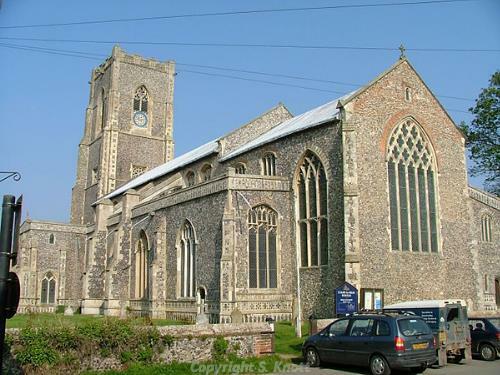 The parish has its own stations, situated on the Norwich to Cromer Line, and is just under 5km south of North Walsham. It contains the large village of Worstead, as well as the hamlet of Meeting House Hill. The name ‘Worstead’ is derived from the Old English for site of homestead. The earliest objects to be recovered from this parish are two Neolithic polished flint axeheads (NHER 7573 and 17513). A Bronze Age stone axe-hammer (NHER 11398) and a decorated Bronze Age palstave (NHER 11132) have been found, and the cropmark of a probable Bronze Age round barrow (NHER 49221) has also been recorded. An excavation on Front Street has discovered the remains of a probable Iron Age ditch on a south to north orientation. No objects from the Roman period have been discovered, and no certain objects from the Saxon period have been noted. However, it is known from the Domesday Book of 1086 that the parish was populous and considered to be valuable, and had two churches. One of these is thought to have been St Andrew’s Church (NHER 8208), which is mentioned in a text of 1256 and received money for repair in 1529. It may have been the parish church during some part of the medieval period, and although we know its location, no remains of the building have been discovered. However a number of possible Late Saxon human remains were discovered in 1954 and these may have derived from the churchyard. The other church is assumed to be St Mary’s Church (NHER 8209), which is thought to be one of the dozen or so grandest of Norfolk’s churches. The present building appears to have been begun in the late 14th century, although the majority of the building is in the Perpendicular style. However the chancel retains a large Decorated style five-light east window. The money for this building came from a number of local donors, and it is thought that the majority of that money was derived from the thriving wool business. This saw Norfolk reach the peak of its prosperity and influence, and cloth was being produced across the county, particularly after the influx of Flemish weavers. Worstead itself gave its name to a cloth type which is still produced today. A small number of other later medieval buildings survive, and this includes Manor House (NHER 17023), which was originally two houses built in the early and altered in the 16th century. Unusually it has an entrance and stair projection against the east wall, as well as an 18th century stair balustrade. Also of interest is the undercroft of St Andrew’s Cottage (19461), which is constructed of plastered brick in three irregular bays with pilasters supporting transverse arches. The brick vault is now entered from the road, though there is evidence of stairs rising to the house. In addition Lacey Farmhouse (NHER 22715) is thought to date to the early 16th century and is of brick and flint with a thatch roof. Also recorded is a probable medieval boundary ditch (NHER 38050) and the cropmarks of field boundaries (NHER 49220). Reminders of the wool industry can be seen in several buildings, including Geoffrey the Dyer’s House (NHER 17024). The house dates to the 16th century, and is of brick and flint with a pantile roof and a large double-sized ground-floor room with a particularly high ceiling built to accommodate the looms. Norwich House (NHER 30613) may also have been a weavers cottage, and comprises a jettied building with an 18th century shop front and has an original store cellar and divisions. Other buildings of interest include The Thatched House (NHER 17025), which dates to the late 17th and 18th centuries and has shaped gables, as well as Bengate Farm (NHER 22716) which is a late 16th and early 17th century timber-framed building with a brick and flint covering and a thatched roof. Of a similar date is Worstead Hall Farm (NHER 22717), which has a number of 19th century windows and two reused medieval door surrounds inside. The parish also contains the East Norfolk Railway (NHER 13586), which was begun in 1867 and is still in use today. The Midland and Great Northern Joint Railway (NHER 13581) also ran through the parish. It was designed to link Great Yarmouth to King’s Lynn and was opened in stages between 1865 and 1933. It had a short lifespan, and all of the line is now closed, although some associated buildings are thought to survive. Also of interest is Worstead Mill (NHER 11731) which was built around 1850 and is a four storey brick tower mill. The original Baptist Chapel (NHER 16449) which gave its name to Meeting House Hill was superseded by the current chapel (NHER 17018), which is thought to date to 1829 and is a large square-plan red brick building with a pyramid roof. The cropmarks of a number of post medieval field boundaries (NHER 45256 and 49218) are also noted. World War Two also had an impact on the parish, and four pillboxes survive (NHER 17019, 18036, 21553 and 32561). These form part of a line of defences established along the River Ant, where the road and rail crossings to the east were regarded as important strategic locations. In addition to these surviving features, the site of gun emplacements (NHER 34403) are also recorded, situated on a prominent position overlooking the Ant Valley to the east. It should also be noted that the parish was the site of a World War Two training camp (NHER 34541) which is known to have been established by August 1941 and comprised Nissen-type huts hidden under the available tree cover, tents, a sewage treatment plant, shooting butts, air raid shelters, and pits and emplacements.